Starting out slow ensures that your fundamentals are flawless through repetition, before increasing speed or distance to your targets. By continuously repeating these drills without errors, you will build “muscle memory" and will allow the techniques to ingrain into your subconscious. This will allow for your actions to be duplicated automatically when you return to the range -or if you are ever thrust into a shooting incident. The 50 new SureStrike™ Shooting Drill Cards are offered by Laser Ammo and will regularly challenge your skills and develop you in to a master shooter in a matter of days. With basic, intermediate and advanced cards, these scenarios are safe, fun and challenging for shooters of all ages and experiences. 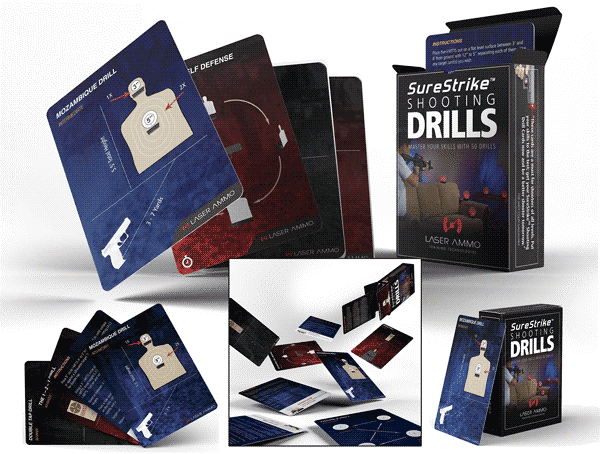 Put your skills to the test; get your SureStrike™ Shooting Drill Cards now and be a better shooter tomorrow.